While the overall foreign student population in Australia has declined this year, the number of Pakistanis studying in Australia is continuing double-digit growth, according to recent Australian government data on international education. Pakistan has now become the top growth market for Australia's struggling international education industry, even though revenue from its neighbor India fell almost $1 billion in a single year, according to The Australian newspaper. New Australian Bureau of Statistics figures reveal that Australia's fourth-biggest export industry is turning to new markets to counter a $2.2bn loss of revenue last year. Australia's earnings from the top 12 foreign markets all fell last year, topped by India, which slumped by 37 per cent, but Pakistan bucked the trend, with revenue rising 15 per cent to $253 million. Australian international education revenue from Pakistan has been rising, more than tripling over the past five years. Earnings from the boom-bust Indian market are down 50% in two years, collapsing from a 2009 peak of $3.1bn. With rising urban middle class, there is substantial and growing demand in Pakistan from students, parents and employers for private quality higher education, including vocational training, along with a willingness and capacity to pay relatively high tuition and fees, according to the findings of Austrade, an Australian govt agency promoting trade. Private institutions are seeking affiliations with universities abroad to ensure they offer information and training that is of international standards. A common concern about Pakistani students is that they might not return to serve their country. I think this is a genuine concern but it is often overblown. Pakistanis with advanced training are helping their country of origin in many ways. Those who are living and working overseas send significant amounts of money home to help Pakistan's economy. Others contribute their know-how by returning home as doctors, engineers, professors and other professionals and technocrats on a permanent basis or by frequent working visits. Examples of foreign-educated Pakistanis who are directly contributing to the nation include a Fulbright computer science scholar who has returned home to help fight terror, a plastic surgeon helping victims of acid attacks, a heart surgeon setting up a hospital in a remote Pakistani village, successful business executives, scientists, university professors and deans, current central bank governor, current finance minister and thousands of others. It is extremely important for Pakistan's public policy makers and the nation's private sector to fully appreciate the expected demographic dividend as a great opportunity to turn the nation's fortunes for the better. The best way for them to demonstrate it is to push a pro-youth agenda of education, skills development, health and fitness to take full advantage of this tremendous opportunity. Failure to do so would be a missed opportunity that could be extremely costly for Pakistan and the rest of the world. Not sure, but don't you think that it's counterproductive that potentially the most productive members (because of financial background and education)of the "young" population that you boast end up looking for opportunities outside pakistan? Take yourself for instance. Except for working on a perception correction agenda for pakistan and maybe the odd contribution to one of the many pak flood rescue missions (out of sympathy) and the likes - i doubt that pakistan has greatly benefited from your vast achievements that you have most conspicuously displayed. You have cited only anecdotal evidence of a few guys returning and contributing meaningfully. For pakistan to reap the benefits of the demographic dividend, the demography in question would have to exist in pakistan, not escape from it. Anon: "You have cited only anecdotal evidence of a few guys returning and contributing meaningfully." It's beyond anecdotal. A significant percentage of Pakistanis do return home sooner or later to contribute to Pakistan's development. Just look at the faculty of any Pak university, or major institutes of research, or think tanks, or business leadership in private sector, or technocrats in the public sector, and you'll find people with advanced foreign degrees working there. They are providing the critical mass to launch Pakistan's knowledge economy. And diasporas, too, contribute in significant ways. Remittances of a billion dollars a month and rising help Pak economy. Visiting faculty and other experts are visible everywhere. Conferences on various subjects often feature overseas Pakistanis as speakers and participants. I myself live in Australia. 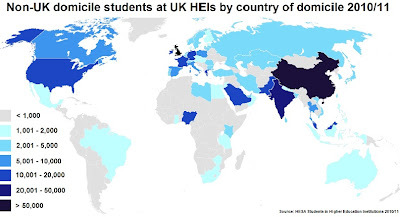 Pakistani students are coming here in slightly greater numbers because European countries have been steadily tightening the noose on the dodgy bunch. Interesting stat: For student visas applied from within Pakistan, the "higher education by coursework" has a success ratio of less than 50%. Obviously the dodgy bunch is trying get here now that the UK has given their peers the boot. Either way, 6800 students is miniscule considering the total student population is well above 300,000. Twister: "Obviously the dodgy bunch is trying get here now that the UK has given their peers the boot." The definition of "the dodgy bunch" is very subjective. It's usually whatever the consular officer decides and his or her state of paranoia given the broad discretion they are given by their governments. American college officials have been particularly upset by the drop in foreign students inflows since 911. 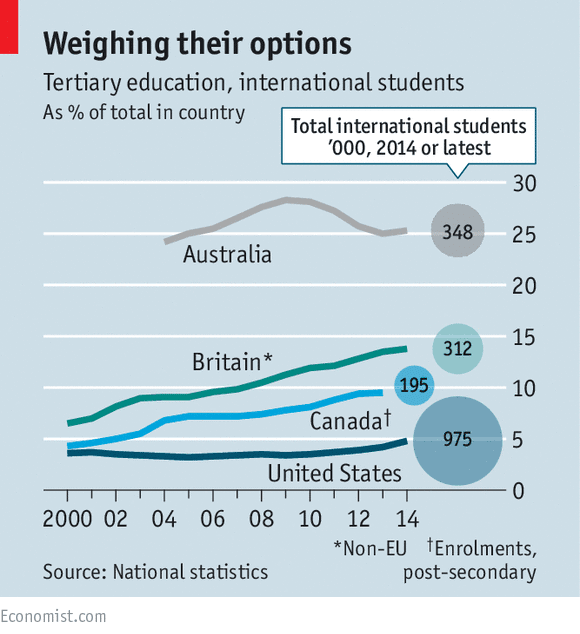 "Of all the issues, perhaps none are as contentious as those surrounding international students. College officials continue to complain that tighter visa restrictions put in place after the September 2001 terror attacks have scared off potential students, even as some of those constraints have since been loosened. They also worry that current immigration law makes it tough for overseas students, even those in high-demand fields, to stay in the United States after graduation, which could handicap the country in the competition for top global talent." "Marlene M. Johnson, a council member and executive director of Nafsa: Association of International Educators, argued that there is an "urgency" for the commission to tackle immigration and visa matters. "There's no other country in the world sitting around doing nothing on this," she said. "If we do nothing, we get behind-er and behind-er, so to speak." The organisation charged with promoting British education overseas has rounded on the government over its student-visa changes, calling for an "urgent review" of the policy to avert damage to the economy and the possible closure of university departments. Jo Beall, director of education and society at the British Council, told Times Higher Education that the crackdown could result in a few more jobs for young Britons "flipping hamburgers and pulling pints", but at a great cost. She made the remarks as the British Council sent research to the government on the US and Australian experience with student-visa restrictions - later relaxed in both countries after drops in international student numbers. The report picks out the impending closure of the post-study work option for non-European Union students and tougher English-language requirements at the sub-degree level - with the latter "expected to have a negative impact on pathways leading to higher education". It concludes that "recent immigration changes have managed to single out the UK as the country with the toughest immigration regime when compared [with] its competitors", with the post-study work options in Australia, Canada and the US able to draw "genuine and career-driven students" away from the UK. Dr Beall said the research showed that pathways to university and post-study work needed "urgent review...if we're not going to undermine the economic benefit that higher education as an export sector brings". The British Council study cites Department for Business, Innovation and Skills research estimating that UK education exports were worth £14.1 billion in 2008-09. Universities Australia estimated that student visa tightening cost Australia A$428 million (£292 million) in 2010, it notes. A poll to beat Gallup poll. BBC poll on countries with negative image. Pak is ranked #2. Maasha allah. Anon: "BBC poll on countries with negative image. Pak is ranked #2"
The growing numbers of Pakistani students studying abroad shows how determined young Pakistanis are to pursue higher education in the face of such bigoted negative propaganda by the Western governments and media targeting Muslim nations like Iran & Pakistan. FDI in Pakistan rose to $5.4 billion in 2007-2008. In addition to high visa denial rates for Pakistanis, one of the impacts of negative perception survey ranking Pakistan as the second worst is that it has badly affected FDI as well. According to the latest data released by the State Bank of Pakistan on 15th May, foreign private investment in the country dropped to only dollar 595 million in July-April, 2012 as compared to dollar 1.622 billion in the corresponding period last year, showing a huge fall of over 63 percent. Out of this, foreign direct investment (FDI) fell to dollar 667 million as against dollar 1292.8 million in the comparable period of 2011-12, while portfolio investment showed an outflow of dollar 71 million in sharp contrast to an inflow of dollar 329 million in the corresponding period last year. Sector-wise, the most discouraging news was in the telecommunication sector which used to be the favourite area of investment of foreigners but witnessed a profoundly high net outflow of dollar 327 million of investment during the first ten months of the current fiscal as against an inflow of dollar 73 million in July-April, 2011. The power sector also recorded a net outflow of dollar 25 million compared to a net inflow of dollar 129 million in the same period of last year. FDI in financial business declined to only dollar 54 million compared to dollar 223 million in the corresponding period of 2010-11. Transport and trade sectors also witnessed massive declines of 83 percent and 55 percent, respectively, in FDI during the year. However, investment in the oil and gas exploration sector at dollar 466 million witnessed an increase of 12 percent during July-April, 2012. Country-wise, FDI from the US was the highest at dollar 196 million followed by the UK at dollar 171 million, Italy at dollar 162 million and China at dollar 113 million. A steep fall in FDI during the first 10 months of 2011-12 is definitely disturbing news for the country, especially at a time when the economy is in dire need of liquidity to revive its growth prospects to create job opportunities and reduce poverty. Also, foreign investment is crucial for technological upgradation, innovative improvements and overall modernisation of the industrial base to allow it to be competitive at the international level and enhance exports to narrow the widening trade gap. Of course, the compulsion to attract FDI would have been less severe if the country was able to generate the required level of domestic resources to finance the needed investment, but obviously this is not the case as indicated by a huge gap in these two variables. The most worrying aspect of the situation is that foreign investors have, over the years, changed their perception about the country as a favourable destination of investment and shifted their attention to other countries. This is indicated by a steady decline in FDI in the country from dollar 5.4 billion in FY08 to dollar 3.7 billion in FY09, dollar 2.2 billion in FY10 and dollar 1.7 billion in FY11. If the present trend continues which we have no reason to contest, the inflow of FDI during 2011-12 could be less than dollar one billion or highly inadequate to make any meaningful contribution to the country's economic prospects. The reasons for a rapid decline in FDI in the recent years are not difficult to understand. Anon:"Bigotted western reports?and hiding obl has nothing to dowith this negative perception"
Do you know that, according to CNN terrorism analyst Peter Bergen and others, including US officials and experts, no evidence has emerged to point to Pakistani govt's complicity in "hiding" bin Laden? Have you heard about Whitey Bolger who was on FBI's most wanted list for 16 years, 6 years longer than bin Laden? Do you think the western media should spin Bulger's case as "America hiding most wanted fugitive" and cover it non-stop for years? Do you think the entire nation of America should be held responsible for this failing? Shaikh also highlighted the performance and achievements of government during last 10 years. He said that there are 71 universities in Pakistan in 2002, but in last 10 years, 66 new universities have been added in Pakistan. Previously, female enrolment was 37 percent, now it is 45 percent. Previously, numbers of PhDs were 1,500, now 10,000 new students have been enrolled in PhD, added the minister. He also mentioned that federal government has spent Rs 160 billion on promotion of higher education in the country. The federal minister said that federal government has transferred additional Rs 800 billion to provinces during the last four years to enable the provinces to provide their population best social services like health education. He also advised students to be proud and loyal Pakistanis. Shaikh said that it is a great day for the degree holding students, so they must thank their parents and teachers. He also assured that the government is doing every effort for the promotion of education sector in Pakistan. i am confused. Why is Pakistan spending on IT education so much? So that they compete Indians in doing routine work. I thought Pakistanis are destined for something intellectually far superior. Azhar: "i am confused. Why is Pakistan spending on IT education so much?" You are confused because of your poor reading comprehension. The story is about expanding enhancing virtual education and the venue for the speech is Pakistan's Virtual University that recently won the top international award for its open course ware. Can you show me any other publication, article or data other than yourself which draws the conclusion you have from the Barro-Lee research paper? As an Australian, I agree with my mate Twister. 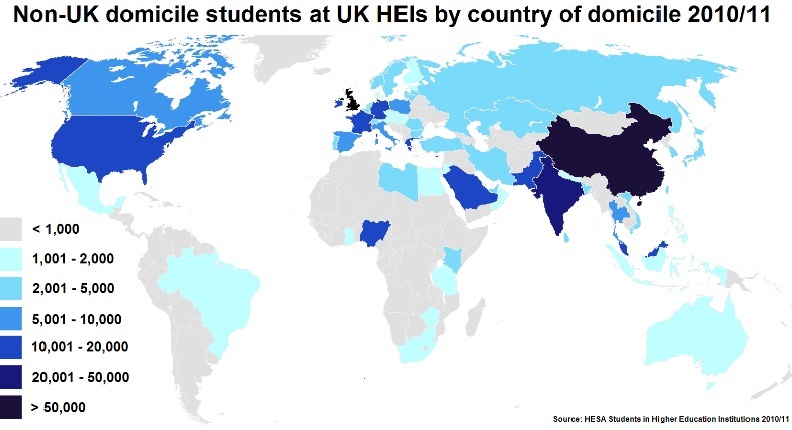 "Pakistani students are coming here in slightly greater numbers because European countries have been steadily tightening the noose on the dodgy bunch." Sorry mate but that's my take. Since 2001, for the most part there has been a decline in visas issued to Pakistani students in the US. That trend is certain to continue given the current political effort to scrutinize applicants from countries directly seen as hotbeds of terrorist activity. Farid Sen: "Can you show me any other publication, article or data other than yourself which draws the conclusion you have from the Barro-Lee research paper?" Barro & Lee data speaks for itself requiring no interpretation. Corroborating data from UNDP shows that the mean years of schooling in Pakistan is half a year longer: 4.9 years in Pakistan versus 4.4 years in India. Aussie: "most of them want to leave Pakistan at all costs"
Some of them, yes, even though Pakistan's employment growth has been the highest in South Asia region since 2000, followed by Nepal, Bangladesh, India, and Sri Lanka in that order, according to a recent World Bank report titled "More and Better Jobs in South Asia". Emigration is not unique to Pakistan if you look at the global migration trends from the developing world to the developed world. With aging populations in the West the western governments need more young migrants from the younger demographics in developing nations to fill jobs and help pay for the retiree benefits. The longest lines for visa are see in India outside foreign consulates and more than million Indians "escape" each year, according to Indian blogger Cyber Gandhi. As for Pakistan, it has the world’s sixth largest population, seventh largest diaspora and the ninth largest labor force. With rapidly declining fertility and aging populations in the industrialized world, Pakistan's growing talent pool is likely to play a much bigger role to satisfy global demand for workers in the 21st century and contribute to the well-being of Pakistan as well as other parts of the world. Ramesh: "Since 2001, for the most part there has been a decline in visas issued to Pakistani students in the US." The number of Pakistanis in the United States has more than doubled in the last decade due to increased immigration, according to US Census 2010 data. With 100% increase since 2000, Pakistanis are the second fastest growing Asian immigrant group in the United States. Pakistani-American population doubled from 2000 (204,309) to 2010 (409,163), the second largest percentage increase after Bangladeshis' 157% increase in the same period. Barro-Lee data is used in the UNDP Education Index which then is used to calculate the all encompassing HDI. For the Education Index (EI), Barro-Lee paper seek to address two main criteria: expected years of schooling for 7 years and above and mean years of schooling for 25 years and above. Both criteria are absolutely required for the EI. As you see it is not at all about 'graduation' rates but more to do with the Education Index. Talking about Education Index, India's EI is 0.450 & Pakistan EI is 0.386, not 0.356 as you claim. There are several components of EI, such as overall literacy rate, enrollment rate & mean years of schooling. While Pakistan is behind India in literacy and enrollment rates, it has an advantage over India in mean years of schooling...meaning that Pakistanis who enroll stay in school longer and graduate at higher rates than their Indian counterparts. In an Op Ed piece titled "Knowledge Economy" published in The News, Pak HEC chair Javaid Laghari argues for greater investment in education by the govt. While the author's intent to goad Pakistani govt into higher funding of education is laudable, his use of stats to make his case makes little sense. He talks about 504 universities and 80 million Internet users in India which represent a lower percentage penetration for India's 1.2 billion people when compared with 143 universities and 20 million Internet users in Pakistan. I think we should expect more persuasive data from this gentleman. British universities have experienced a fall of more than 30 percent in Indian enrolments while the percentage of the number of enrolments and visa grants for Australia is reported to be in three figures. The number of Indian student visa applications for Australia has gone up by a whopping 120 percent in the last nine months while the number of visa grants has also improved by nearly 80 percent in the same period. Eric Thomas, president of Universities UK - the representative organisation for Britain's universities - has reportedly written to British Prime Minister David Cameron, warning that the immigration changes could cost the country as much as five billion pounds ($8 billion) in tuition fees alone. The recent immigration crackdown is reported to have led to Indian students shunning British universities. Besides Australia, the Canadian and European universities and vocational training institutes are also benefitting from international students looking for overseas options other than Britain. In a similar scenario a few years back, Indian students had shunned Australian education providers after the country tightened immigration rules. 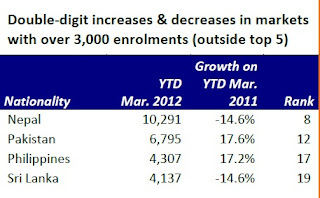 The massive decline in Australia's number two source for international students, India, led to the Australian government ordering a review of the enrolment and student visa process. Among other recommendations, a former New South Wales minister, Michael Knight, had pressed for a post-study work visa for international students in his "Strategic Review of the Student Visa Programme 2011" report. British authorities, on the other hand, have abolished Post Study Work Scheme for international students. Many critics of the immigration curbs consider this as the single-most damaging of a "multitude of recent policy changes". Indian students seem to be have reacted negatively to the denial of work rights in Britain as the number of applications for British student visas from India and other South Asian countries is on a sharp decline. To make it worse for international students interested in working while studying in Britain, the Cameron government has also removed work rights for most private college students. Work rights for other students were also reduced to just 10 hours a week. Australia and other countries under the Organisation for Economic Co-operation and Development (OECD) wooing international students are much more liberal as far as work rights for international students are concerned. The ongoing economic gloom affecting Britain and other European countries is also forcing some Indian students to study in safer havens like Australia and New Zealand where unemployment rates are much lower. India's mounting economic and political woes are prompting market players to raise the specter of a Greek-style crisis in Asia's third largest economy. This is not simply idle speculation. Last Friday, the rupee crashed to an all-time low against the dollar of 54.9 and it was stuck most of Tuesday at the psychologically significant Rs55/USD level, where the currency is seen as having no obvious technical support. And the implications of a rupee collapse would be immense. "It could go to stratospheric levels against the dollar and it looks to me as if the Indian government is aiming at a de facto devaluation in an effort to prop up flagging economic growth. And you then have to worry about all the unpleasant boxes such an action would inevitably tick, such as straining further the country's already strained balance of payments as well as bringing on an almighty wave of inflationary pressure," said a credit analyst at a ratings agency in Singapore. He added that a spike in the rupee would strain the cashflow of corporates and banks as they struggled to service dollar-denominated debt and that the odds of a widespread Indian debt restructuring would be low. In his opinion the market will determine the rupee's level, with a formal devaluation seen as unlikely given the consequent need for interest rates to be pushed significantly higher to contain capital flight and counter toxic inflation levels. This scenario was seen in the UK in 1992 when the country exited the ERM and the government pushed short term interest rates up to 15% from 10%, spending billions of pounds of reserves to defend the currency in the process. Should something similar occur to India, it would almost certainly lose its coveted investment-grade rating, with a one-notch demotion required for that to occur. S&P has India on negative watch for its Baa3 foreign currency rating while Moody's and Fitch retain a stable outlook on the country. As the country's government faces political impasse amid infighting, principally between prime minister Manmohan Singh and finance minister Pranab Mukherjee on the subject of tax reform, and India limps from one corruption scandal to the next, the sense of decay is palpable. Surprisingly, India's deteriorating economic fundamentals and toxic politics have not yet impacted the relative value of its issuers offshore debt. In fact, on Tuesday India's dollar offshore curve recovered the 10bp it had widened on Monday. But that situation is unlikely to hold much longer. "As market players start to fret about the possibility of a full-blown rupee devaluation, you will see this start to impact spreads on the country's offshore curve. If the currency goes in a big way, you will have a unilateral replaying in India of the Asian financial crisis, which involved default on short-dated offshore debt and a mass round of debt restructuring. India is hanging in the balance right now, and the worst case scenario seems increasingly likely to play out," said a Hong Kong-based syndicate head. Just as the tide moves against them, though, Indian corporates are seeing the need for offshore funding increase. According to the credit analyst, many Indian corporates have reached borrowing ceilings with local banks and are sizing up offshore bond issuance as a result. That would be a tall order and an expensive trip, though. With massive convertible maturities coming up, some in dollars, a local market that is increasingly saturated and has less support from foreign investors and a closed dollar market, it seems inevitable that restructuring will soon become the main activity for Mumbai-based investment-bankers. Rubbish the problem with Greece is that the Euro prevents it from boosting exports by depreciating the drachma. In India as the rupee declines exports surge.Last year Indian merchandise exports grew 16% to cross $300 billion. Also oil and commodity prices are declining further improving the trade balance. Anon: "In India as the rupee declines exports surge.Last year Indian merchandise exports grew 16% to cross $300 billion." Exports to where? The West? If 2011 was a difficult period for Indian exports, 2012-13 would be worse. Exports had a healthy run in the first half of 2011-2012, while growth rates had been steadily falling since August. However, exporters are set to begin the new financial year with growth rates that are already grim, and down to single digits. According to analysts and economists, while exports are facing severe shortage of demand in developed countries, even new markets would fail to ease the burden, as these also depend heavily on exports to Europe and the US. The order books for the summer of 2012 have already seen drops of 20-30 per cent, and exporters are not very hopeful of orders in the spring or winter as well. “The big stores and outlets in Europe are all asking for a discount. The situation is very grim, as the supply is more and demand is shrinking by the day. Compared to 2011 summer orders, this year these are almost 30 per cent down,” said M Rafeeque Ahmed, president, Federation of Indian Export Organisations (FIEO) and chairman, Farida Group, a leading leather exporting firm. Commerce secretary Rahul Khullar had recently said 2012-13 would be harder for exporters, as a solution to the euro zone crisis was still uncertain, and recovery in the US was sluggish. Looking at the government’s fiscal condition, it might not be able to dole out incentives for exporters, unlike previous years, he had said. 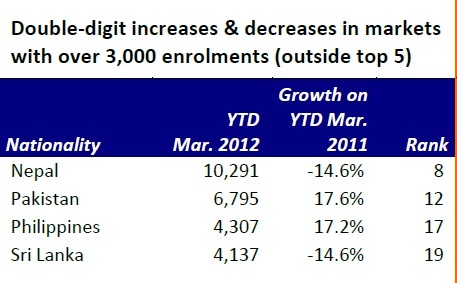 “The first couple of quarters of 2011-2012 had been very robust, but things have come to a standstill since then. We have no hopes of doing better, even in the upcoming financial year, which is already starting on a very poor note. It is not easy to go to new markets at this juncture. There is a fear factor among exporters, owing to the high volatility in exchange rates,” said R Maitra, executive director, Engineering Exports Promotion Council. akistan will seek to reduce inflation to less than 10 percent for the next fiscal year as it grapples with the fastest pace of price increases in Asia. The inflation goal for the 12 months starting July 1, 2012 is 9.5 percent, the prime minister’s office said in a statement in Islamabad yesterday. Earlier this month, the government projected gross domestic product will rise 4.3 percent in the period, up from 3.7 percent in the current fiscal year. Pakistan’s economy has been hurt by blackouts, a trade deficit, diminished aid flows and an insurgency on the Afghan border. The government plans to boost spending on roads, health care and education to support growth and is due to present its last federal budget next week before elections that must be held by February. Pakistan’s rupee has weakened about 6.5 percent against the dollar in the past 12 months. Domestic risks and the threat to global growth from Europe’s debt crisis have curbed demand for the currency. Farm output will climb 4 percent next fiscal year, up from 3.1 percent in 2011-2012, according to yesterday’s statement. The industrial sector may expand 4.1 percent, from an estimated 3.6 percent this financial year, the projections showed. The targets were set in a meeting of the National Economic Council, which is headed by Prime Minister Yousuf Raza Gilani. Pakistan’s inflation accelerated to an eight-month high of 11.27 percent in April, limiting scope to cut interest rates to support the $200 billion economy. The pace of price increases is the fastest in a basket of 17 Asia-Pacific economies tracked by Bloomberg. The central bank left borrowing costs unchanged at 12 percent last month for a third straight meeting, after cutting them by 2 percentage points in 2011. The council proposed to spend 873 billion rupees ($9.5 billion) on development projects in the year starting July 1, up 19.5 percent from 730 billion rupees in the current fiscal period. The council originally proposed expenditure of 863 billion rupees yesterday, before increasing the planned outlay by 10 billion rupees in a revised statement later the same day. The Asian Development Bank has said the power deficit in Pakistan and damage to the cotton crop from floods last year may restrict economic growth to 3.6 percent in the year ending June. The government will unveil the federal budget in parliament in the first week of next month, according to local media reports. The US government, through the US Agency for International Development (USAID), is sponsoring a two-week study tour for 27 deans and faculty members from Pakistani universities nationwide as well as provincial secretaries of education at Columbia University, New York. The tour is designed to enhance these Pakistani education professionals’ capacity for strategic planning and policy development. A pre-departure orientation reception was held here on Thursday under USAID to bid farewell to these participants. USAID Deputy Mission Director Ms. Karen Freeman, while speaking on the occasion, said it would be a great opportunity for the participants to interact with their counterparts so as to how they can make the education more relevant, more accessible to students, discuss policies etc. “It would be a wonderful opportunity equally for them to learn from you that how you are improving the standard of education in Pakistan and how HEC is bringing about reforms in the country. Pakistan and the United States have enjoyed a long and close cooperation in higher education that spans more than 50 years and covers a variety of disciplines from science and medicine to teacher training. This USAID-funded study tour is yet another expression of the US government’s long-term commitment to Pakistan and is having a transformational impact on teacher education,” she said. Additional Secretary for Inter-Provincial Coordination Furqan Bahadur Khan appreciated the efforts of the US government for improving the quality of education across the country. Earlier, study tour participant Ms. Marium Rab from FJWU and Sindh Department of Education Parvez Ahmed Seehar shared their expectations and views about the tour. Australia has said that it will open a trade office in Faisalabad and immediately lower customs duties on imports from Pakistan – steps that are aimed at giving a boost to bilateral trade. Speaking at the Faisalabad Chamber of Commerce and Industry (FCCI) on Thursday, Acting High Commissioner of Australia Paul Molloy also announced that his country would provide $100 million in aid for various development projects in Pakistan. He promised that visa concerns, highlighted by FCCI members, would be addressed and asked the business community of both sides to try to deepen trade ties. He assured that he would facilitate the visit of an FCCI trade delegation to Australia. Australia had a liberal investment policy and an open economy, he said. Molloy said more than 100 students of Pakistan were getting Australian scholarships every year. FCCI Vice-President Rehan Naseem Bharara, while highlighting the tremendous trade potential between the two countries, stressed the need for Australia to give special market access to Pakistan, which is suffering a lot as a partner in the war against terror. In order to strengthen economic activities, he said, exchange of trade delegations and joint trade fairs were a prerequisite. At another event, Paul Molloy, while addressing scientists at the University of Agriculture Faisalabad (UAF), affirmed that Australia would continue to support and develop the agricultural sector of Pakistan. “UAF is working with different Australian organisations on various projects that will bring prosperity, especially for the farmers,” he said. He asked the scientists to keep working with commitment and share their innovative ideas with Australia for attracting funds in order to excel in different sectors that would pave the way for development. “Idea is an issue, but money is not,” he remarked. Speaking on the occasion, UAF Vice Chancellor Dr Iqrar Ahmad announced that Lorry Water House’s chair would be established at the campus soon to address genetic and breeding issues of various crops. “UAF is a partner and beneficiary of the Australian Centre for International Agricultural Research project and engaged in citrus and mango research activities. We need to expand our areas in order to address various issues including water, energy and climatic changes,” he suggested. However, Ahmad pointed out that the same Australian research programme in India was quite diversified, covering a wide range of activities with a special focus on food security, water resources and climatic changes. He called for introducing the programme on the same pattern in Pakistan. Ahmad said UAF would send 10 PhD students to the University of Sydney in the near future to strengthen their capabilities, which would help Pakistan cope with agricultural problems. Pakistan's natural and human resource potential was matchless, Economic Counseller of Australian High Commission, Melissa Kelly, said Thursday while declaring some of the recent signs of growth in Pakistan as very inspiring. Melissa Kelly was talking to a delegation of Federal of Pakistan Chambers of Commerce and Industry (FPCCI) that included Chairman FPCCI Standing Committee on Diplomatic Affairs, Sheikh Humayun Sayeed and Chairman Media FPCCI, Malik Sohail. "Despite numerous challenges Pakistan's economy was doing well which is very encouraging," she said and added "all major international investors and companies are making profits despite the security challenges." The Economic Counsellor said Pakistan is the gateway to energy rich central Asian states, financially liquid Gulf states and economically advanced Far Eastern countries. Besides, she said that Pakistan has world's second largest salt mine, fifth largest gold mine, fifth largest coal reserves, seventh largest copper mine; great consumer market and fourth largest competent workforce in the world. Melissa Kelly said that an Australian delegation has just completed visit of Pakistan and they have decided to investment in the citrus sector including construction of a juice extraction plant. She said that there is a great scope of cooperation between Pakistan and Australia in different sectors including energy, industry and agriculture. On the occasion, Sheikh Humayun Sayeed highlighted the salient features of liberal and deregulated trade regime of Pakistan which offered enormous opportunities for foreign investors. Stressing the promotion of economic links, Sayeed said that the two countries should boost exchange of delegations and expos which will bring business communities together that would lead to more trade in future. Malik Sohail Hussain appreciated the role of Australian High Commission in promotion of trade and economic relations between the two friendly countries. He said that Australia can get access to central Asia by using Pakistan as an economic bridge. Malik Sohail said the perception about Pakistan is not what is portrayed as it better than most of the regional countries in case of doing business, strong infrastructure, fast growing middle class. Australia is the third choice for Pakistan students studying abroad, incentives can help Canberra climb the ladder, he said.